Well, I did great for the first three months of the year. My two RSC18 projects were worked on each month and one was finished in time for the next. Somehow April and most of May slipped by and I didn’t work on either of them. Knowing myself, I figured I had better get caught up. Once I am too far behind, it becomes very easy to talk myself into skipping it altogether. We know what happens next don’t we? The blocks I did make end up in orphan block land, a very sad place to be. While I am not totally caught up yet, I feel much better with the progress I made. To remind you, I am sewing along with Angela and Mari’s Squared Away BOM and I am making nine patch blocks for a separate project. April’s color was yellow with a touch of gold. 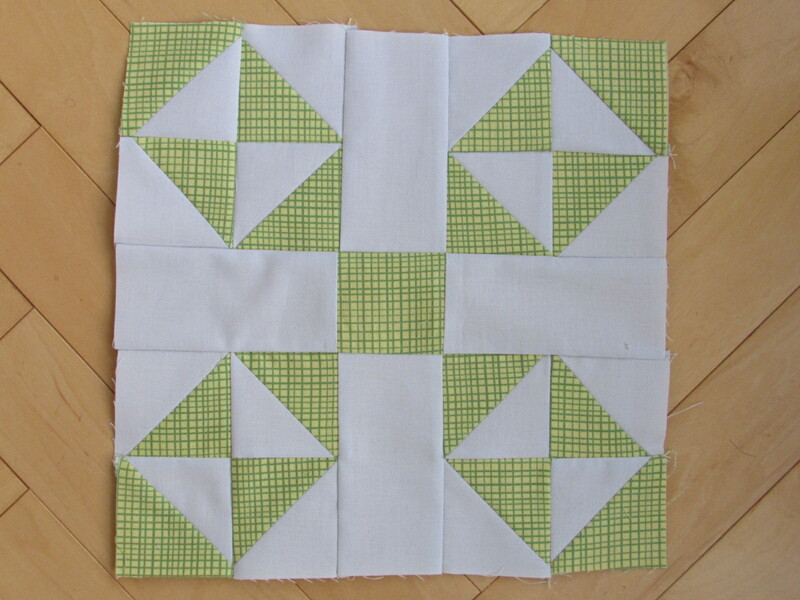 The block tutorial for the month was the 4X Star, also known as the Carrie Hall block. 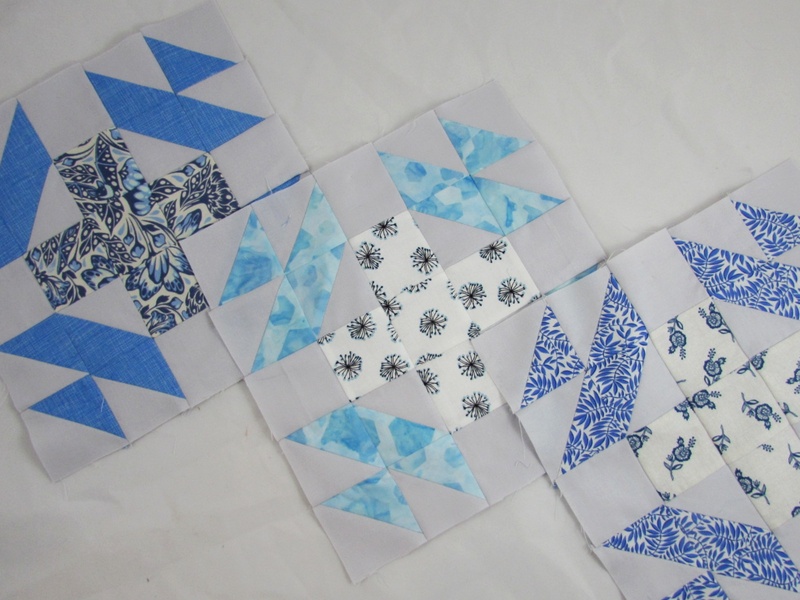 These made for super easy piecing as only squares and a handful of HST’s were required for each one. 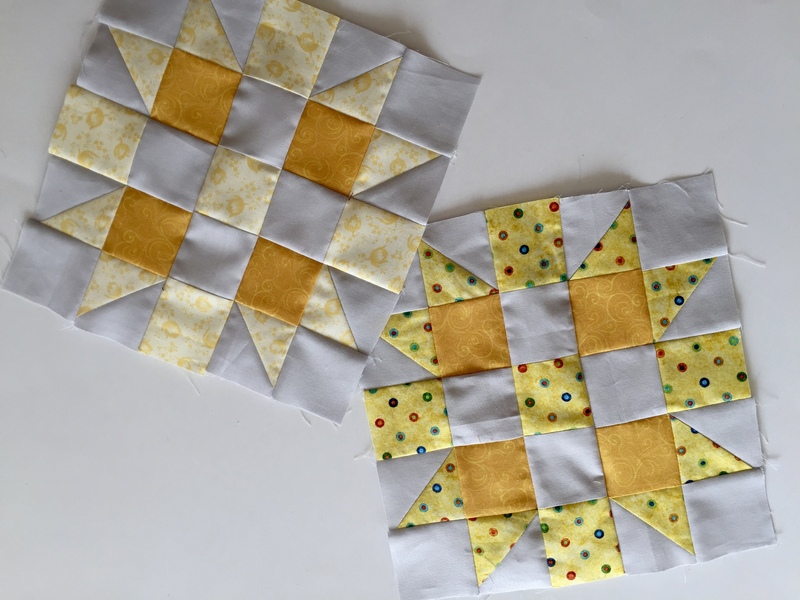 I love both of these blocks – note that I used the same golden fabric for the four squares in the center but it looks quite different on each one. I was having a really tough time finding scraps of yellow for April because I only had such a small amount of yellow. Mentioning this to Mari, she sent off a huge packet of yellow scraps. 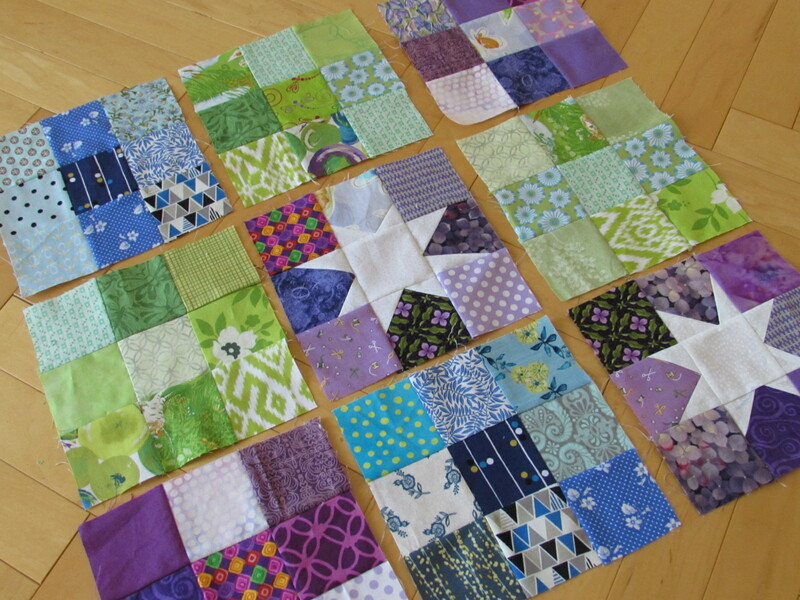 Though her idea of scraps might be different then mine because she generously sent a number of fat quarters. So, Mari’s tutorial, Mari’s fabric….. I wonder what it would take to get her to come to California to cut my pieces and stitch them up? Thank you Mari! May’s color is pink and rose. This was easier for me as I have plenty of pink scraps in my stash. I don’t know if I really went with rose but I like the combinations I came up with thus far. The block for this month is by Nancy Cabot, called Baton Rouge Square. Mari describes it as a package with ribbons tied at the top. I like that! Again, these are easy blocks to construct as long as you watch the direction of each HST. At this point, I still need to make one more of each block for both April and May, and I will be good to go. June’s block will pop up on Saturday so I better get these done! Here is a shot with all of my Squared Away blocks to date. Looking good, with the exception of the missing pink and yellow blocks! I am thinking of placing them on point and sashing them with a gray that is a tad darker than the background color I am using. But there is plenty of time to figure out those details. Finally I did make a few nine patch blocks. I haven’t made the wonky stars in pink yet, but these are quick and simple to put together. Now I am off to the sewing room to make a custom Chemex Cozy for a customer in Virginia. Time to get busy. Also, come back on the first of June as I have some updates about my shop to share with you. Until then, happy sewing! Linking to Let’s Bee Social and Needle & Thread Thursday. Info on both of these is found at the top of the page, under Link Ups. Have you signed up for my newsletter? It is published every month or so and is full of information about my shop, new arrivals, sales, and events. Click here to sign up! This entry was posted in Block of the month, Scrappy Quilting and tagged academic, academic quilter, rsc18, scrappy nine patch blocks, squared away, wonky stars on May 30, 2018 by Bernie. First of all, thanks to everyone for the get well wishes. I am feeling better and have spent the last day or two getting caught up on things. Whenever I spend time down due to some illness or other, it is always so satisfying to get back to normal and have a regular day. Do you know what I mean? It makes me appreciate normal. Today I am sharing my RSC18 projects to date. 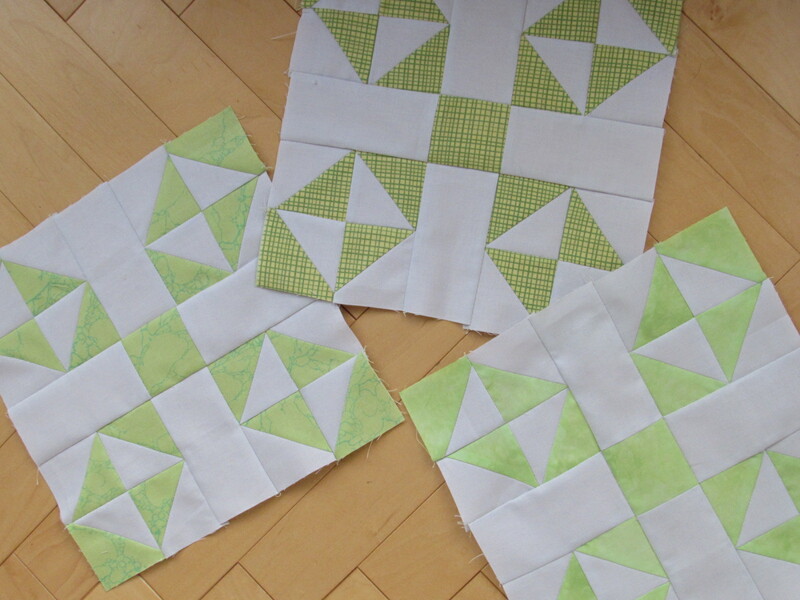 I finished the green blocks on the last day of March but never took pictures or posted them. The block for March is called Red Cross and dates to 1897. I don’t get the name but it is a fun block to make. Luckily I didn’t sew any bits together with the green HST’s pointing the wrong way (unusual for me, I know!) The color was to be light or bright green and this was easy as my green tub is truly overflowing. 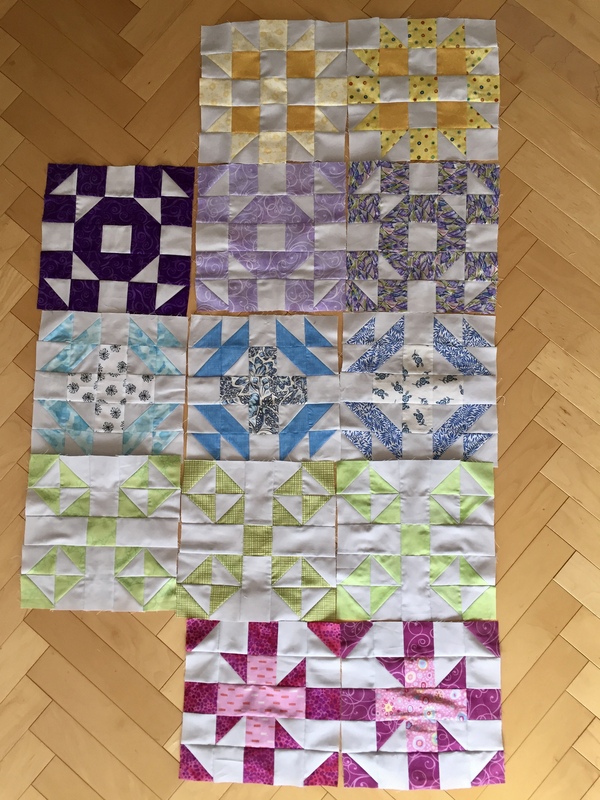 Like January and February, I tried to keep to the same scrap for each of the Squared Away blocks. Two of the greens look very similar (the lower two) but I am fine with this. This green and yellow fabric is striking -somehow I have no idea where it came from. Usually I can remember but not this time! I love sampler quilts but sometimes they have a very busy look to them. I think using the gray background and keeping the fabric the same within each block is going to add order to the quilt. 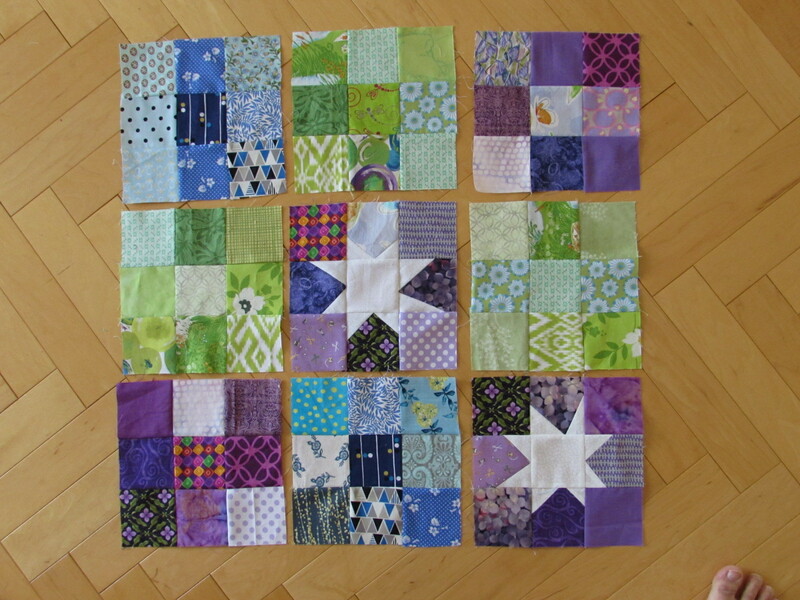 Here are the blocks together, though none have been squared yet. There is a third purple block but my OCD self couldn’t take the picture with an extra block hanging out in space. Oh dear, what is wrong with me anyway?? I have said this before but it bears repeating. 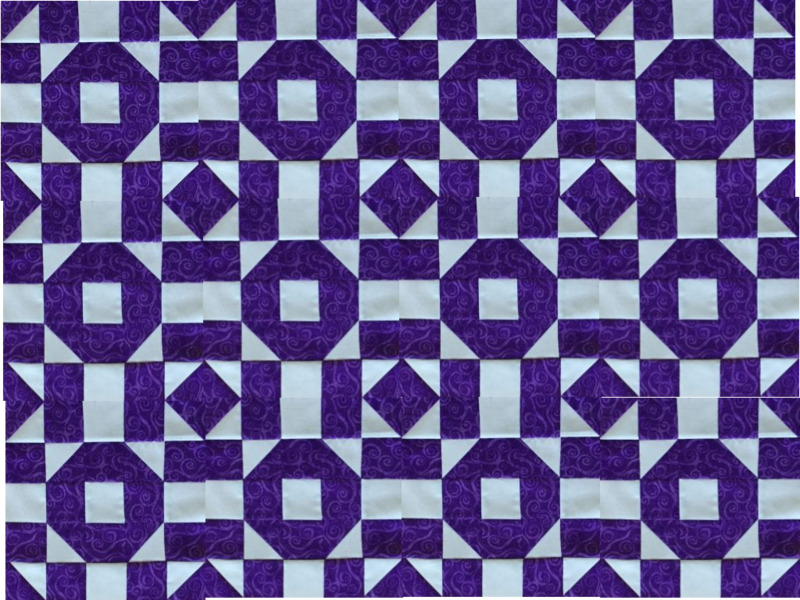 Mari, designer of the quilt for Squared Away, does an excellent tutorial and I appreciate the bit of information she provides about each block. 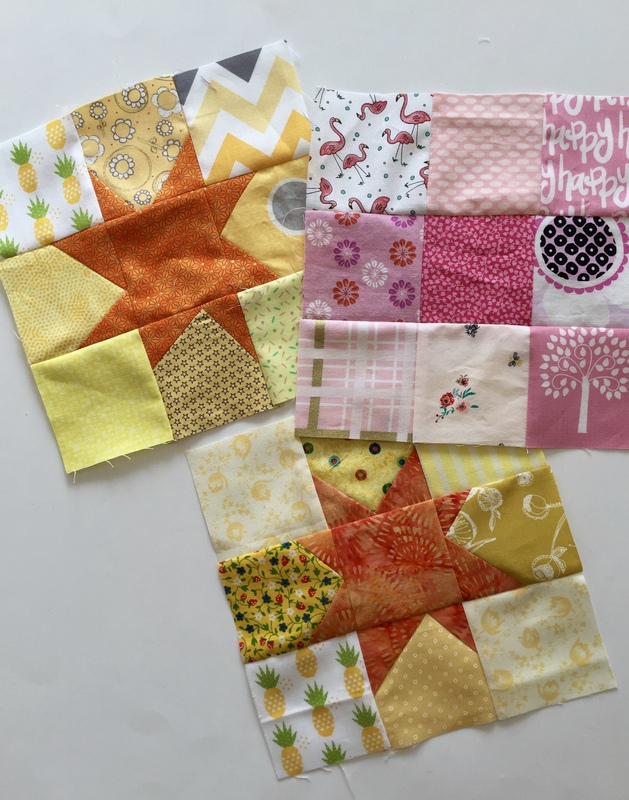 If you haven’t sewn along with her before, I highly recommend her block of the month projects. Organizing, writing, preparing for this sort of event has to be incredibly time consuming. Thank you Mari! 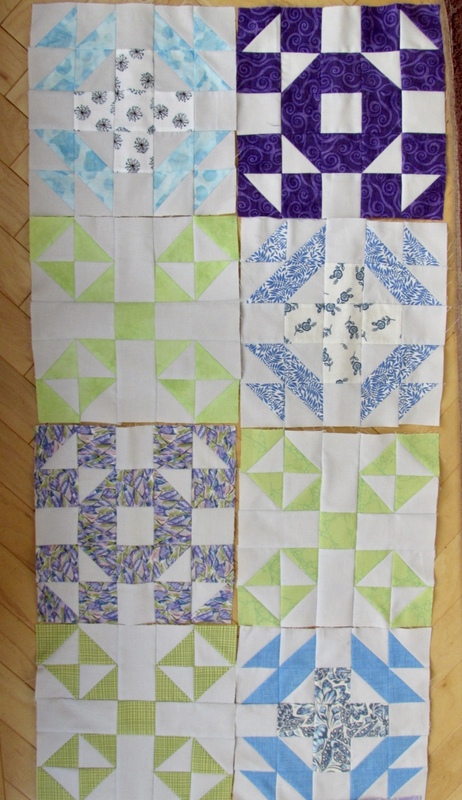 As I make the Squared Away blocks, I have also been pulling smaller scraps from the bins and making nine patch blocks. These finish at nine inches each. In February I did a few wonky stars to go with the purple set. I really like these and will make more as I go along. I am unsure what I will do with these. Maybe just sash them in black and use it as a donation quilt. 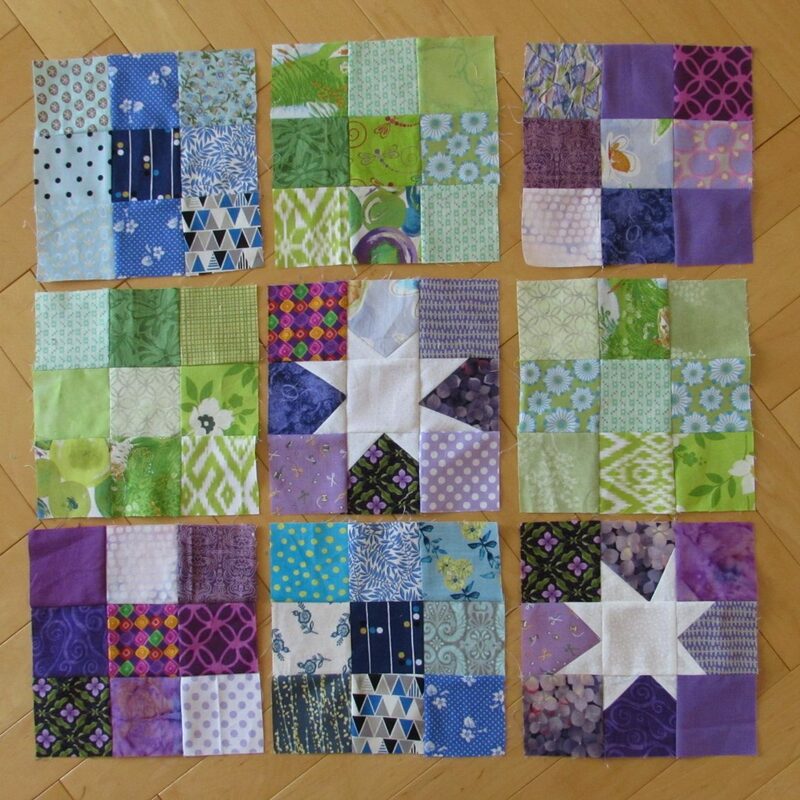 The nine patch blocks are a breeze and this uses up more of the small scraps in each bin. The wonky star blocks add interest to this project. I need to pull yellow scraps for April. This could be a challenge because I have so few yellow scraps. There are some charm squares I might be able to utilize, depending on the cutting instructions for the April block. Another project I worked on this week was cleaning up my shop. I have deliveries tomorrow and next week. Hurray for new fabric!! There was a stack of 1/2 and one yard cuts that were end of the bolt so I did some measuring and pricing. Each of these is listed in the Bargain section of the shop. Come take a look, maybe you will find something you like! Enough for now. I have lots to do. Hope you are all enjoying a ‘normal’ day too. Linking up with a number of blogs, including Finished or Not Friday. See the list up at the top of the page, under Link Ups. This entry was posted in Block of the month, RSC Challenge, Scrappy Quilting and tagged nine patch, rsc18, squared away, wonky stars on April 12, 2018 by Bernie. It is already mid-February and the Rainbow Scrap Challenge color of the month is purple. 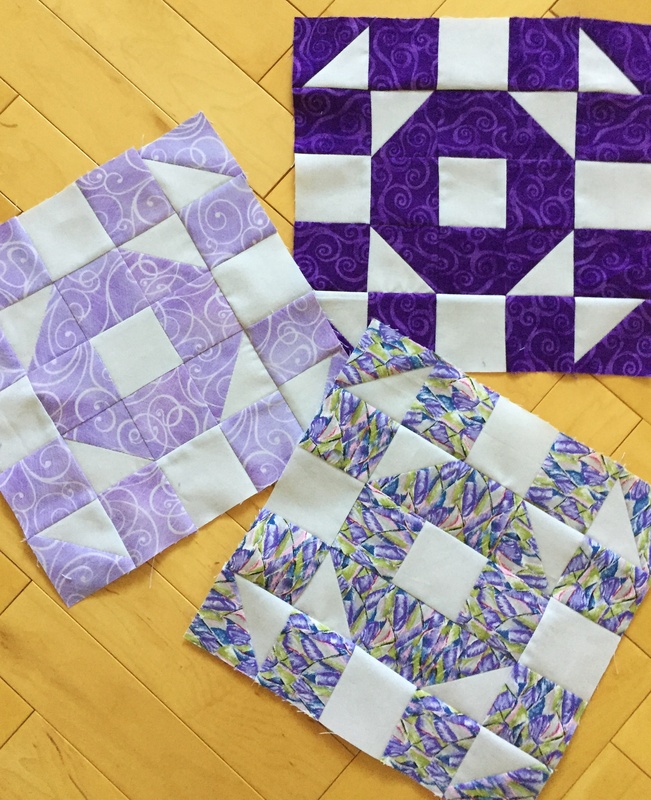 On Tuesday I set aside my doll quilt projects and pulled out my purple scrap bin. It was time to get to work on some scrappy piecework. I have decided that, as much as the scrap bins allow, I would like to use one fabric throughout each block with the same gray background throughout. I think it will look more cohesive. Luckily I had some reasonably large purple scraps so it worked for this month. I had some fun playing around with these blocks. I think it would make a great quilt on its own. 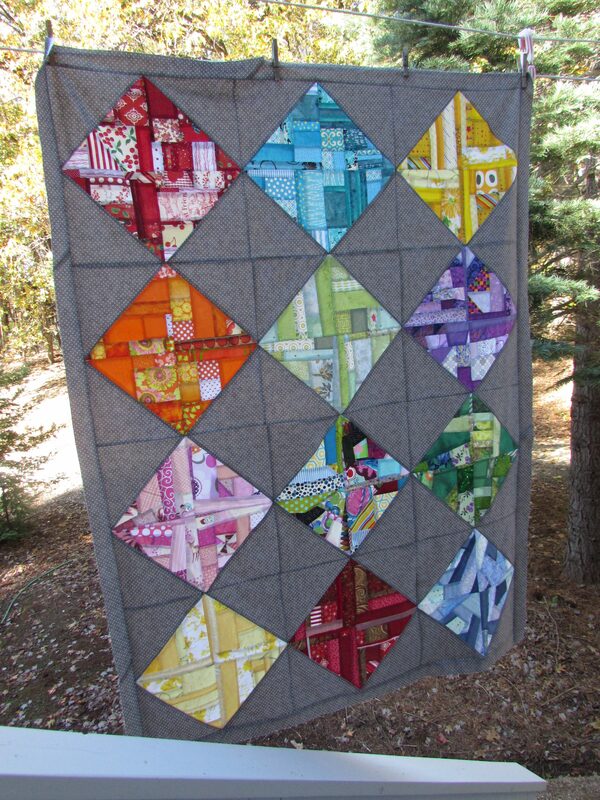 I have not made a quilt with just two colors but maybe someday…. I like it. ( Though I doubt I would choose purple for a whole quilt.) There are some fun secondary patterns that appear with this block. Have a good weekend everyone. We are enjoying spring like weather so it should be a nice one! Linking up to my favorites. Please take a look at the Link Up tab at the top of the page. This entry was posted in Block of the month, Scrappy Quilting and tagged rsc18, squared away, wishing ring block on February 16, 2018 by Bernie. Last year I didn’t participate in the Rainbow Scrap Challenge held each year by Angela of So Scrappy. 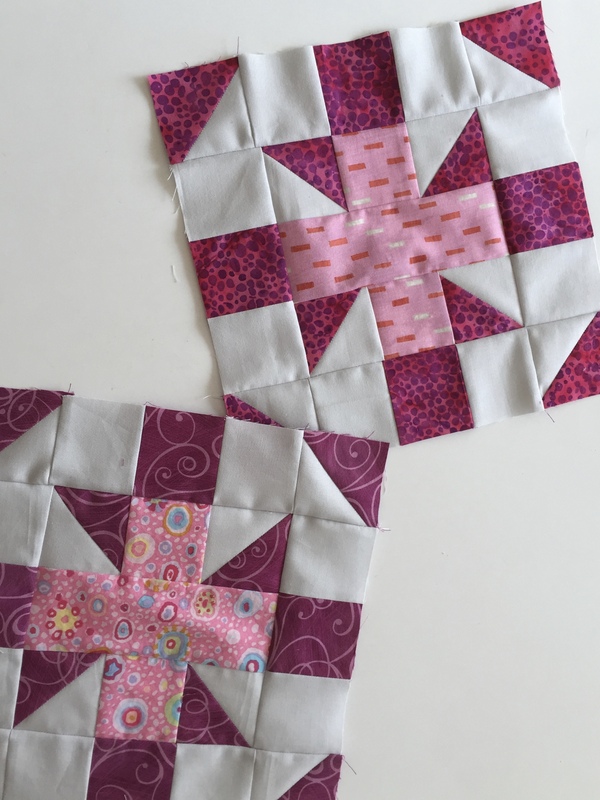 I did participate in 2015 and 2016 though – it is a great way to use up scraps. This year I plan to follow along with the BOM hosted by Mari of Academic Quilter, Squared Away. I sewed along with Mari during her first quilt along, Classic Stitches, back in 2015. I had a great time and loved the clear directions Mari provided with her posts each month so I am happy to sew with her again this year! If you want to see the row quilt I made, click here. Here is the first month’s block, Red Cross. According to Mari, the block is a Clara Stone block that dates to 1906. Traditionally, this block is made with red, but since the color this month is light blue, that’s what we made it in. I have a large piece of pale gray solid fabric (I am fairly sure it is a Moda Bella solid but I don’t know which one) I have set it aside in the hopes it will be enough to use as my background color for this year. 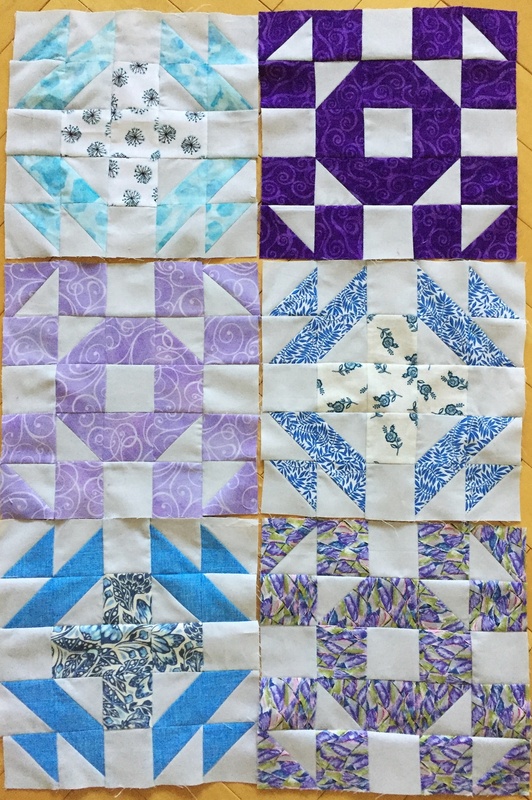 We are making three 10″ blocks each month which will make a nice size quilt by the end of the year. I am happy with the look of this first batch of blocks and they came together easily. Not to say I didn’t have to rip one apart though. I had one corner section pointed the wrong way. It hung on my design wall for quite a while before I noticed it. At least it is early in the game and was a quick fix. I am also making little 5″ square crumb blocks. I want to finish this scrappy HST quilt I started in 2016. I really like it but feel it would be nice to have it a bit larger before I finish it. I am going to make a border by alternating five inch crumb blocks of all colors with the gray polka dot. 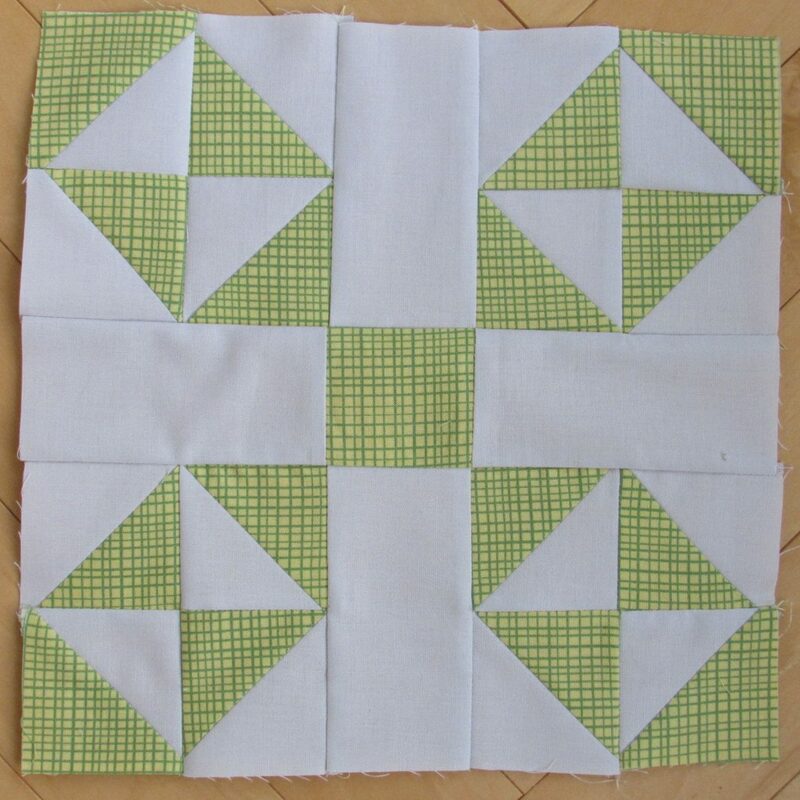 I think the gray polka dot will be rectangles, not squares, to make the border more interesting. I have to look at the math on that, certainly not my strong suit as you all know!! I don’t plan to take all year to make these crumb blocks though (by following the color schemes of RSC18). I hope to get this one finished earlier in the year. In other wonderful news, I just had SIX days migraine free days in a row! It was heavenly, like a gift, you know? It has been many months (probably didn’t happen at all in 2017?) since I had that long of a run. Unfortunately, I woke up last night with a zinger but I was able to sleep it off and I feel reasonable this morning. It will be a good day to take it easy and play with my scraps. Fortunately, one doesn’t need to think too hard to make crumb blocks. 🙂 Hoping you have a lovely weekend and are able to enjoy some creative time! 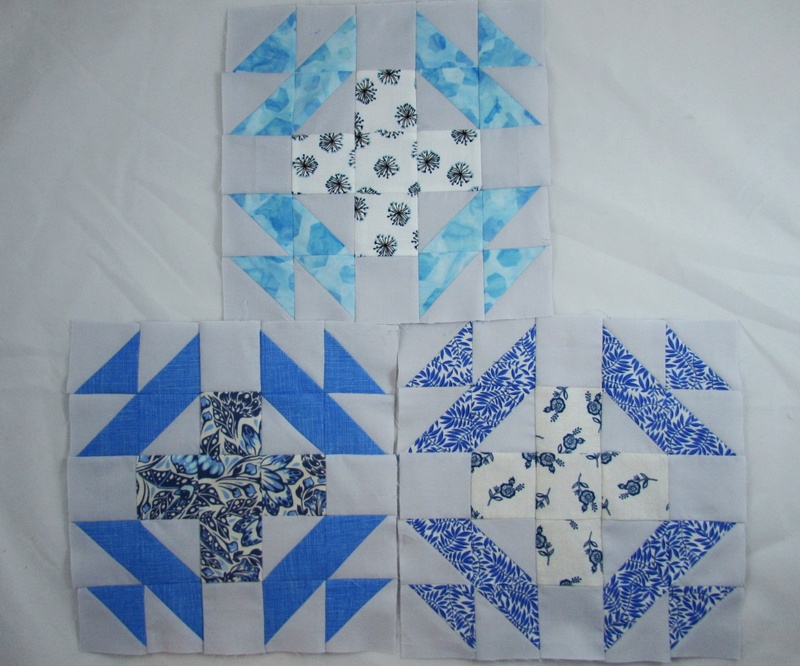 Linking to Finished or Not Friday at Busy Hands Quilt as well as a few others. Check the Link Ups tab at the top of the page! 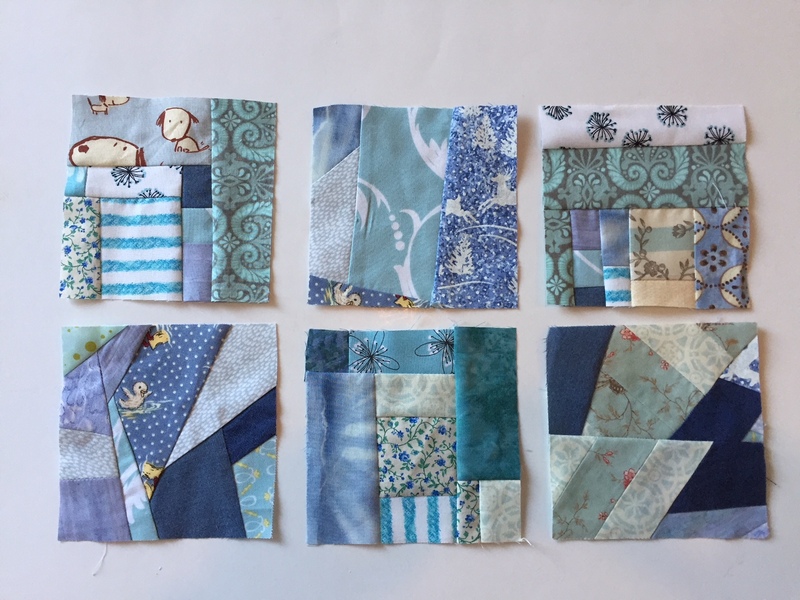 This entry was posted in Block of the month, Scrappy Quilting and tagged rsc18, Scrappy Quilting, squared away on January 19, 2018 by Bernie.